We were so happy to receive your most recent newsletter. It was extra special to us since there was a feature piece on Tucker who is the brother of Vegas who we adopted back in January. 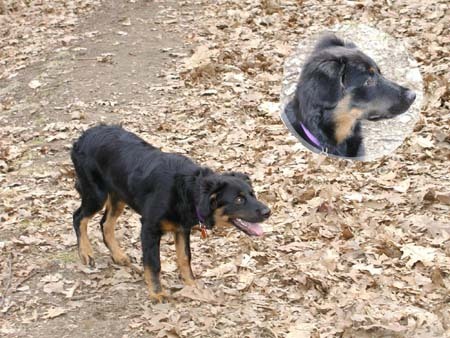 Of course you remember her as Little Bertha and looking like she did in the picture to the right that we took at your house when we first picked her out. It's been a very busy winter and spring with her and we have often thought that we should send an update to let you know how things are going. After seeing Tucker we figured we should let you know how at least one other pup is doing. As you know we had been trying to get as many of the pups together for a puppy play group on the weekends but as the weather got nicer it began to get harder to get them all together and we have now not seen any of the others since March. It was great watching them all grow and develop their own personalities. Vegas has now gone through what seems to be her real growth spurt. She currently weighs about 35lbs and though she has not gotten very tall, she has grown extremely long. She has now lost all her baby teeth and has a full set of pearly whites. As she continued to develop we began to see more and more traits of border collie. . I spent a weekend learning more about that breed and it seems safe to say that she seems to be a border collie/lab mix. As you can see by the picture to the left, she even has the border collie stance. We feel like we've come a long way from when we first brought her home. One of the issues we seemed to have early on was determining just when she needed to go out. We had our share of accidents because we just never seemed to be on the same schedule as she was. We were told that we needed to find a way for her to let us know it was time. We decided on a bell next to the door that is at her height and after a few days of showing her to hit it with her paw before going out we had found our answer to the potty training! The only problem we have still been faced with is the car and getting car sick even for short distances. She loves going to the park to play and continues to get in the car no matter what it takes to get there. We were concerned how she would interact with dogs other than those from her litter but so far she has been great. 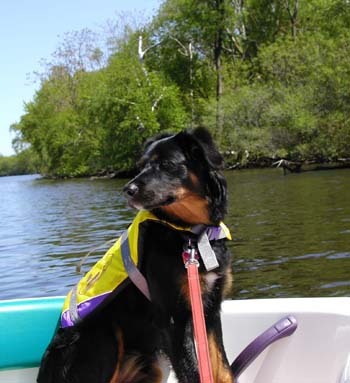 We've been taking her to the Fresh Pond Reservoir where she has been able to experience a wide variety of dogs. Most of the time you will find her just playing ball though. She LOVES to play ball. All types of ball. I think she now has every type of ball there is and she even chases pucks. Anything that rolls, she on top of it! We have been amazed at her speed. Despite her size, she is by far the fastest dog we've seen. Now that the weather is nice you can also find her at the head of her Papa's boat. We weren't sure how she would do on the boat since we have such issues with her getting car sick but she seems to do much better on the boat. When we got her life preserver she threw a fit and did everything to get out of it but as soon as we put her on the boat she didn't mind having it on at all. It was almost like she knew. She has a great time watching the ducks and geese as we go by. We're sure she's just trying to figure out a way to get to them. Since she isn't a big fan of water we haven't had to worry about her jumping off after them though we still keep her on leash just in case. Well, we really just wanted to thank you again for the opportunity to adopt Vegas for she has added so much joy in our lives. She seems to always amaze us! We also keep our family amused with all the stories and pictures we have of her. We also wanted to let you know how great it was to have the email addresses of the other the puppy owners because it was really great to keep up with them and even get to see some of them in those first months.